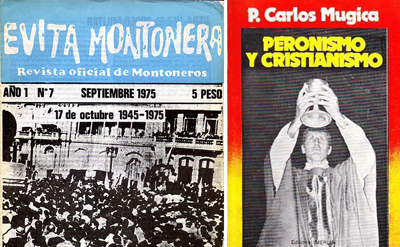 This article is about the slum priest movement in Buenos Aires, its Marxist origin and its “star” Fr. Carlos Mugica. Most importantly, the article reports how this movement was revived and “prioritized” by the then-Archbishop of Buenos Aires, Jorge Mario Bergoglio, who, now as Pope Francis, still supports this movement. Peron [Juan Carlos Peron, a famous populist leader], who was allied to the communists in Argentina, spent 10 days in Cuba with Fr. Mugica who, on his return from Paris, joined the Movement of Priests for the Third World. 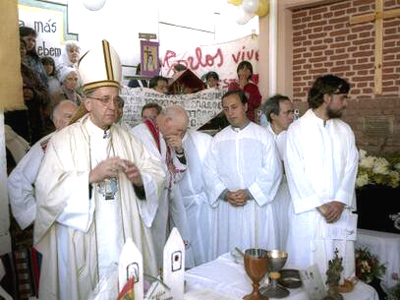 Long after Mugica was killed, Archbishop Bergoglio said a Mass in a slum area, under a placard reading: "Carlos lives"
The precedence of the material over the spiritual, the basic error of the ‘slum priest’ movement, is also the presupposition of the condemned modernist Sillon movement, the Catholic Worker movement, as well as the Distributist movement being spread today in Catholic Traditionalist circles. These data gathered by the L.A. Times allow us to affirm without a doubt that Jorge Bergoglio, during the time he was Archbishop of Buenos Aires and now as Pope, gives full support to a communist movement of priests in Argentina. 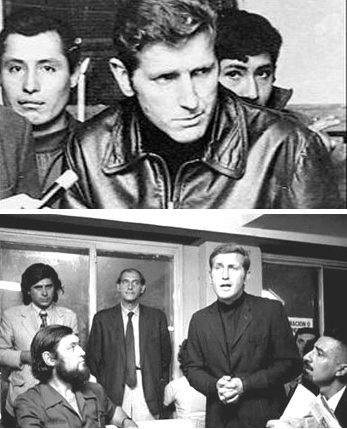 The characteristics of the movement show that it was not only Marxist inspired, but had close links with the communist-terrorist Montoneros guerillas in Argentina. It seems to me that this makes the Slum Priests movement as dangerous as the communist Brazilian Liberation Theology. This report gives us yet another demonstration of the communist-friendly profile of Pope Bergoglio.